Part of my work at BCcampus is to co-administer a provincial shared service of Kaltura with my colleagues at BCNET and UBC. 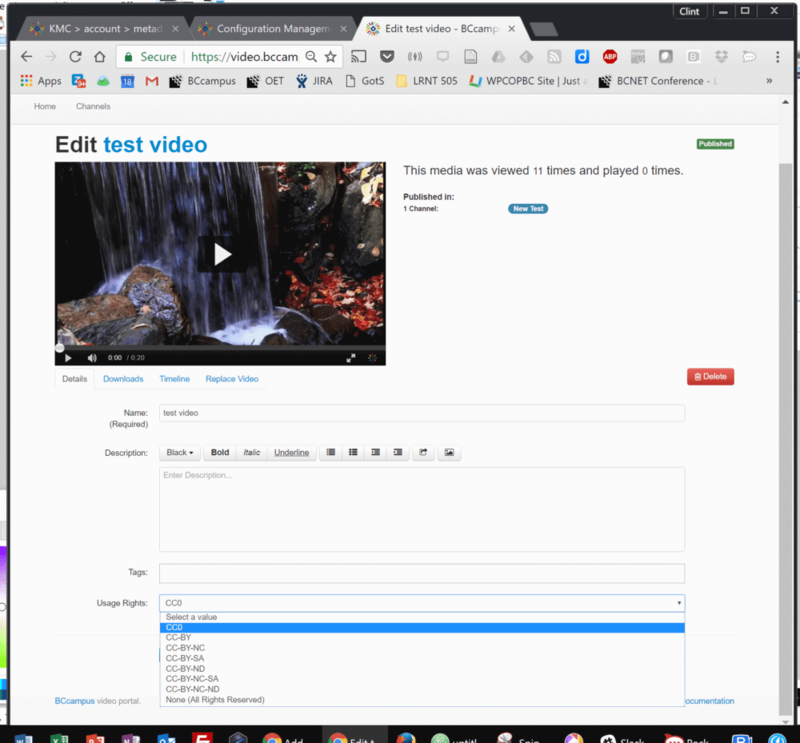 Kaltura is a suite of tools for hosting and streaming media. Mediaspace is the YouTube like front end for Mediaspace. 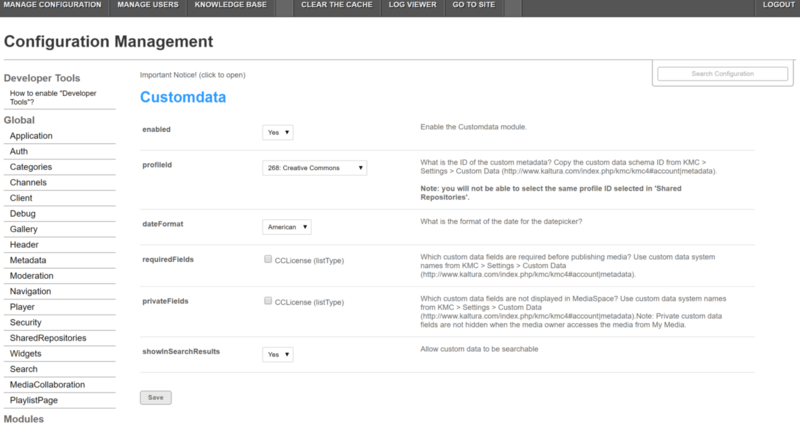 Because of that, BCcampus has access to some of the Kaltura tools for our own business uses and, for the past couple weeks, I have been mucking around with our new Kaltura Mediaspace instance. In general, I find Kaltura a beast. It is complex, and there are multiple layers of administration to go thru depending on the tools you want to use. It is powerful, no doubt, and has some wonderful features. But likely not a system you want to tackle off the side of your desk to fully grok how it works and, just as important, fully maximize a fairly sizable institutional investment. At any rate, I have been making some progress on setting up our Mediaspace site. You can take a look. Keep in mind it is being built in real-time and not fully configured and setup. But for now, I have some basic branding in place and a few channels with some content set up. One task that I was failing at was creating public channels. I was able to make channels and add videos to channels, but could not seem to make those channels publicly visible unless you had an account. Every time someone would click on the Channels link, they would be taken to a log in screen. For an organization that does open work, having closed channels was a no go. So, after poking around, I went back and did what i should have done in the beginning, which is RTFM. Or, in Kaltura’s case, RTFM’s. Started here, which led me here and here and here and here. Here and here. A bit over here. Some stuff from this 23 page PDF here. Ok, well, you get the idea and why I say complicated. Oy! And no where could I find the damn setting to make a channel public. Finally, in a brief 30 second conversation with my colleague Jordi at UBC, I found the setting. 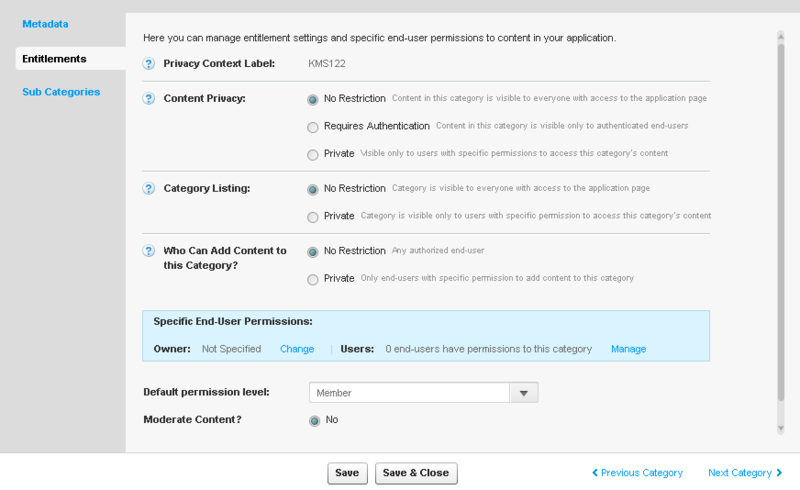 In the Mediaspace admin area, there is a setting called supportPublicChannel that needs to be enabled. That was it. One little setting. Click that and, boom, public channels. Man, there it was. Right there in the Channels section of the administration console. Hours of pouring thru technical support documents & Google searches on how to enable public channels and the problem was solved in 30 seconds by talking to Jordi. There were a few steps I did before this that I’ll add in here just in case others are struggling. This info is specific to those in the BC Kaltura Shared Service, which is an on prem instance of Kaltura. If you are not in the shared service, this may not work for you. The other caveat is that I have been working on this off the side of my desk for a couple of weeks now, along with other config issues with Kaltura and Mediaspace and, because I don’t have the awesome discipline of CogDog to document and share on an incremental basis, may be incomplete and missing stuff (and let’s just pause here and acknowledge just how fantastic CogDog is at documenting the technical work he is doing knowing that there are very likely others out there struggling with the same thing). But, to the best of my memory, here is what I did prior to making that final switch above. On the MediaSpace category, the entitlement (what Kaltura calls permissions) are open. These can be overridden at lower categories. Drilling down to the next layer, Channels, I have set default channels to be Private. When someone creates a new channel, they may want to work on it before making it open. When you create an actual channel, you will need to override this setting, as this screenshot of the actual SCOPE channel shows. In this case, I have overridden the Channel defaults and made the content privacy no restriction, while adding a restriction on who can actually add content to the category (only the channel administrator). 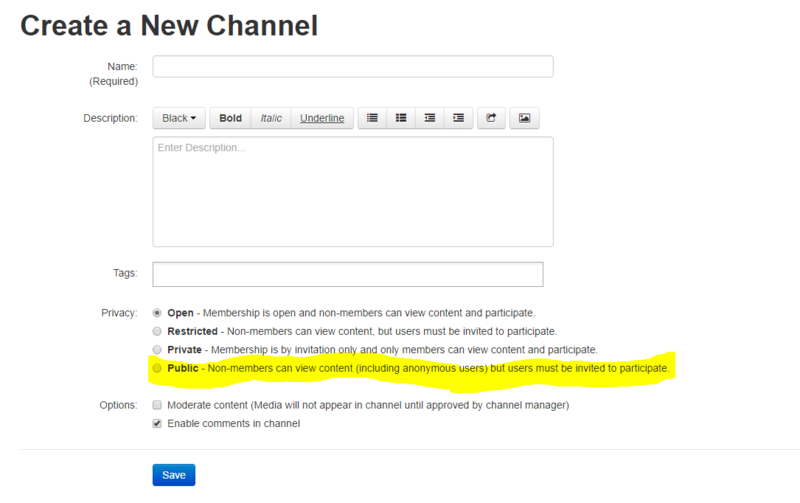 In the Mediaspace admin area, when I create a new channel, I now have an option to make it a Public channel. So, this was a spot that I was getting confused at because, until I flicked the supportPublicChannel option on, I was not seeing the Public radio button. But I was seeing the Open radio button. So, when I clicked Open, I thought that would make the channel, uh Open. But no. In Kaltura, Public and Open are different concepts and it wasn’t until I enabled the supportPublicChannels switch that the public radio button option became available during my channel setup. Clicking that button made the channel publicly viewable without people having to log in. 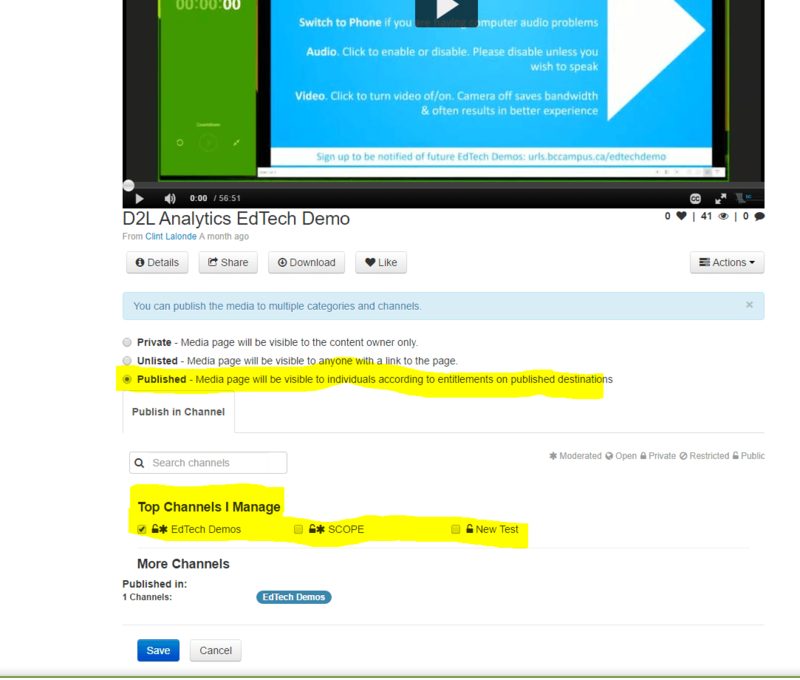 Now, when I upload a video, I can publish it to multiple channels, including the open and public ones. 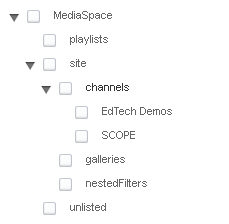 Like I said, this is likely missing out a bunch of other steps I have done along the way to enable public channels on our Mediaspace instance. But for those of you in the KSS struggling with setting up public channels – supportPublicChannel was what finally did it for me. Thanks Jordi!